Fuel ethanol production capacity in the United States reached 15.5 billion gallons per year, or 1.01 million barrels per day (b/d), at the beginning of 2017, according to EIA's most recent U.S. Fuel Ethanol Plant Production Capacity report. Total capacity of operable ethanol plants increased by about 4%—or by more than 600 million gallons per year—between January 2016 and January 2017. Most of the 198 ethanol plants in the United States, representing most of the U.S. fuel ethanol production capacity, are located in the Midwest region (as defined by Petroleum Administration for Defense District, or PADD, 2). Total nameplate capacity in the Midwest was 14.0 billion gallons per year at the beginning of 2017 (918,000 b/d), an increase of about 4%—or by more than 530 million gallons per year—between January 2016 and January 2017. Nameplate production capacity, the measure of capacity that EIA tracks, is the plant manufacturer's stated design capacity to produce fuel ethanol during a 12-month period. Of the top 13 fuel ethanol-producing states, 12 are located in the Midwest. 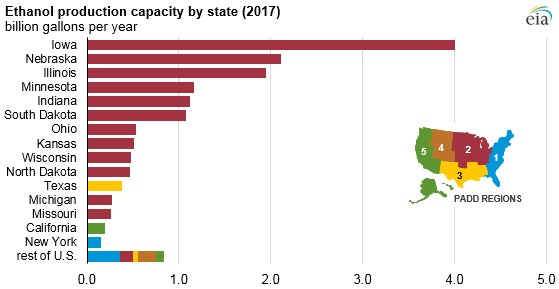 The top three states—Iowa, Nebraska, and Illinois—contain more than half of the nation’s total ethanol production capacity. Actual U.S. production of fuel ethanol reached a total of 14.8 billion gallons (965,000 b/d) in 2016. In EIA's June Short-Term Energy Outlook (STEO), U.S. production of fuel ethanol was forecast to reach 15.8 billion gallons (1.03 million b/d) in 2017, equivalent to slightly more than 100% utilization of reported nameplate capacity as of January 1, 2017. Nameplate capacity is not necessarily a physical production limit for many ethanol plants. By applying more efficient operating techniques, if market conditions provide an incentive to do so, many ethanol plants can operate at levels that regularly exceed their nameplate production capacity. This level of operation, called maximum sustainable capacity, is inherently subjective.